At last some updates for the English version! (31 july 2016) New connection Lille-Chartres and Vézelay-Cluny. More updates will follow soon. Click the numbers at the routes on the map to find route guides. Shift map using the scroll bars. For the walking routes a large map from the Netherlands to Santiago, and a detailed map Netherlands-Belgium. Most information on this site is also availeble in printable pdf files. Find them at Downloads. I am always happy to recieve usefull remarks. Do you have additions, improvements or suggestions or do you want to ask something? You can use Contact to mail me. 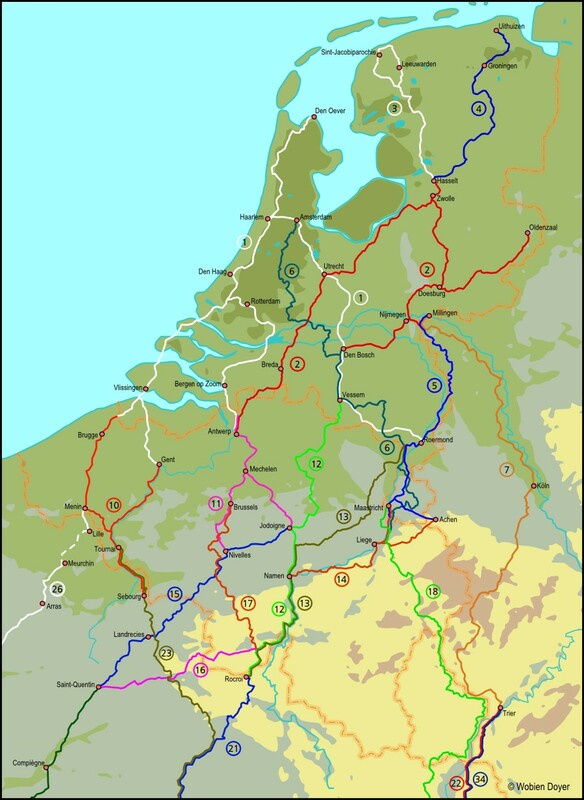 List for map: Walking routes Netherlands - Flanders - Santiago. Jacobswegen in Nederland Part 1 West; 1st edition 2011; In Dutch; Nederlands Genootschap van Sint Jacob, Bram van der Wees a.o. a: Den Oever - Haarlem - Amsterdam - Utrecht - Den Bosch - Postel or Roermond. b: Haarlem - Den Haag - Vlissingen - Brugge or Gent. c: Schipluiden - Dordrecht - Bergen op Zoom - Antwerp. Jacobswegen in Nederland Part 2 East; In Dutch; 1st edition 2011; Nederlands Genootschap van Sint Jacob, Bram van der Wees a.o. There is a new version (partly not yet available). It is now split up in two guides: Via Scaldea and Via Brugensis Both contain a longer route than the old one. Just published! This guide contains both the branch of route 10 via Gent as route 23. 2 books, one with maps and one with text. Will be published soon.. It will contain both the branch of route 10 via Brugge as route 26 until Amiens. This guide contains both the Via Brabantica (route 11) and the Via Gallia Belgica (route15) in two books, one with maps and one with tekst. and Nivelles - Maubeuge - St. Quentin. Via Brabantica en Via Gallia Belgica; in Dutch; 2nd edition 2015; Vlaams Compostelagenootschap; This new version contains both the Via Brabantica (route 11) and the Via Gallia Belgica (route 15). See route 11. This a GR, that from time to time makes big detours compared to other guides on the same trajects. Between Brussels and Tours the differences add up to hundreds of kilometers! Very often beautifull kilometers, the makers of the GR’s rather make beautifull routes than short routes! Namur - Rocroi - Reims - Châlons - Auxerre - Vézelay. Via Campaniensis; Les Chemins de St Jacques de la Champagne á la Bourgogne; in French or in Dutch; Randonneurs & Pèlerins 52; 4e edition 2016; ISBN 978-2-9543565 (French) or 978-2-954-43565 (Dutch); a more simpel version in German is also available. This is only a translation of the texts to be used together with the French version. On this site you can also find information about a Chaîne d’hospitalité pèlerine, sleeping adresses for pilgrims by (former) pilgrims. GR 122 also connects routes 10 and 15, and 10 and 21. There is no guide of this part of the GR 122. On www.gr-infos.com/gr122.htm you can find the traject on Google Maps. Some homework needed. I don´t know how well the red and white signposting is maintained. The new Via Scaldea made by the Vlaams Genootschap (in Dutch) contains both a branch of route 10 as route 23. See route 10. Provisional edition without overnight accommodations, but with maps and toute descriptions. Chemin de St. Jacques de Compostelle Paris-Sens-Vézelay; in French; Association Pèlerins de Saint-Jacques de Compostelle; Lepère Editions; ISBN 978-2-915156-423; 1e edition 2013. Globaly this route follows the Seine and later the Yonne. The next bit (again 23 km) Lille - Meurchin, is not yet described in a guide. This needn’n be a problem. The Canal de la Deûle runs a bit west of Lille and then south to Meurchin and you can follow a large part of it. With a good map that should be easy! The largest traject, Meurchin - Amiens (120 km) is described by Compostelle Arras. There are 14 numbered pdf’s each describing a short traject (map and description). The last one is a map of the whole route. There is also a pdf "Hebergements" with overnight acommodations. Last update 21 juli 2014. Paris - Orléans - Tours - Saintes - Bordeaux - St.Jean-Pied-de-Port. Paris - Chartres - Chateaudun - Tours. Problem of this guide is that it stops at Mirambeau, about 3 days walk before Bordeaux, and that there is not yet a part 3. In Royan you take the ferry over the Gironde to Pointe de Grave. There are 2 main signposted roads: the GR 654 and a pilgrims way, sustained and maintained by 5 pilgrims organisations along the route. They sometimes run together and sometimes they cross each other. The GR runs from Vézelay via La Charité and then to Nevers. In Périgueux it splits in a west branch and an east branch. The west branch is nearly equal to the pilgrims way maintained by the pilgrims organisations via La Réole to Saint-Jean-Pied-de-Port. The east branche goes to Montréal-du-Gers. The pilgrims way has a variant from Vézelay via Nevers and another variant via la Charité and Bourges. After Périgueux it takes the way via La Réole. The GR is longer and makes more (often beautifull) detours, it is clear that the makers of the GR don’t like asfalt! There are two versions: variant via Nevers and variant via Bourges. La voie de Vézelay-La via Lemovicensis; Lepere editions; In French; 3rd edition 2015; Lepere follows sometimes the GR, sometimes the pilgrims way. Connection Vézelay - Le Puy; In Dutch; Henk van Gaal; 1st edition 2005; Topo Aktief Wandelreizen; Where Lepere follows the (rather hilley) GR 3, van Gaal chooses a flatter varriant whith more pilgrim history, at first through the valley of the Loire, than connecting to the route via Cluny to Le Puy-en-Velay. Connection Vézelay - Cluny: If you want to go from Vézelay to Le Puy-en-Velay via Cluny you can use a guide in French of the route Vézelay – Asisi (in Italy). On the site of the Association CHEMINS d’ASSISE you can become a member of the association, and then you can download the guide. After Cluny you can use one of the guides mentioned at route 34. Chemin de Saint-Jacques de Cluny au Puy-en-Velay, Renseignements practiques; Chemins de Compostelle en Rhône-Alpes; Bilingual in French and German; Every year a new version; order at amis-st-jacques.org or for sale at the tourist office in Cluny. Lepere editions; Guide de la Voie d´Arles; in French; edition 2009; Arles - Toulouse - Col du Somport - Jaca - Puente la Reina. Col du Somport - Puenta la Reina. The Road to Santiago; English translation from Spanish; José Maria Anguita Jaén; Editorial Everest; 3rd edition 2007; ISBN 978-84-241-0420-7 whith set of route maps. ISBN 978 90 389 1984 3; 1st edition 2010.
together form a challenging and mountainous detour on the last part of the way to Santiago. Traditionaly to worship in Oviedo El Salvador (the Saviour) in the kathedral of the same name before going to Santiago. Modern pelgrims (with mountain experience!) can do the detour to follow this tradition or to avoid (part of) the busy last part of the Camino Frances. The camino de Invierno can be an alternative for the busy last part of the Camino Frances. It´s name (invierno = winter) comes from the fact that in winter the circumstances on the heigh pass at Cebrero can be rather bad in winter. Than this somewhat lower route can be an alternative. This of coarse is not a route from the Northern countries to Santiago. I mention it here because you can use it to avoid the busy last part of the Camino Frances: Take from Astorga the Eastern branche against the intended direction to Granja de Moreruela and then take the Western branche to Santiago. A Practical & Mystical Manual for the Modern Day Pilgrim; ISBN 978-1-84409-590-2; edition 2013.